Dr. Falguni Vasavada is Professor & Chair, Strategic Marketing Area at MICA. She is a double gold medalist with over two decades of teaching experience in the area of Marketing and Advertising. She teaches across programs and also runs online programs in the area of Advertising Management & Public Relations, Marketing & Brand Management for working professionals. She has trained corporate professionals and mentored young entrepreneurs. 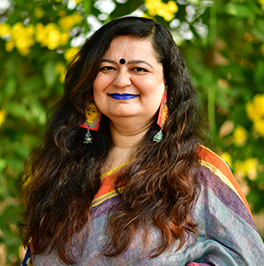 She has published in International Journals and presented papers in national and international conferences and is involved in international joint research projects in the area of advertising. She is a visiting faculty at management institutes of repute in India and overseas. She is a frequently invited speaker to reputed forums/panels/events and also is a TEDx speaker. Her teaching, research and consultancy interests are in the area of Advertising, Branding, and Social Media. She Speaks on Advertising, Branding, Marketing, Social Media, Personal Branding, Gender Equality, Body Positivity, Women Empowerment, Work Life Balance, Happiness as a Lifestyle and Motivation. In her free time, she loves to read fiction on women, watch movies and cook. And yes she loves social networking and believes in being technologically savvy and therefore is available 360 degrees. She influences through writing for youth and women. Her motto of life is – make the best of whatever you have. Appreciate the positives and live life to the fullest! Account Planning Models: Global or Local? - Mom knows it all? A study of food advertising and children, at the 2012 Academy of Business Research Conference held in Biloxi, Mississippi, USA November, 2012.